Weather: The Moonsea region is located in the northern part of Faerun. While not as cold as the Silver Marches, it is much cooler than the Dalelands or Waterdeep, and people dress warmly all year round (a fur cape or cloak is a common article of clothing in the Moonsea). Anyone who walks around in light clothing during cold weather is obviously either a fool or someone who is using magic to stay warm and doesn't care if people know it (and thus a fool). Minor magic items that protect against the cold, such as rings or potions that give resistance against nonlethal damage caused by cold, are in common use among the wealthier people of the Moonsea, who enjoy not having to wear bulky clothing all the time (and these people are the ones who can afford bodyguards to protect them from robbers who would take such luxuries from them). The Moonsea itself, a large inland sea, or huge lake, to be precise, is fed by glacial meltwater and even in summer it can be cold enough to kill a swimmer. Because of this, most people who make their living on the water can't swim, since they've never had the opportunity to practice in its odd, purple-hued waters; instead, they have learned more practical skills such as fire building and how to not fall out of a boat. In the winter months much of the sea freezes over, making travel across the ice possible but (due to the great distances involved) not very common. The larger cities sometimes use icebreaking ships, summoned monsters, or fire magic to keep their dock areas somewhat clear of ice, though this is impractical on a large scale. Ice fishing is common, with fishermen walking to their favorite spots rather than boating. The first snow usually falls in early to middle Uktar, and the land is consistently snowy from Nightal to Alturiak, with occasional snowfalls happening through Tarsakh. The frequent cold and limited technology means that Moonsea inns usually have a small number of large rooms rather than a large number of small rooms; this reduces the number of individual fireplaces needed and the overall risk of fire. Some inns have just one large common room heated by a large hearth. This means these places have less privacy than a typical adventurer's inn but attacks are less likely because there are so many witnesses. The places with smaller rooms tend to use closed metal braziers full of hot coals to offset the chill. Because of the natural cold, those who have the means to magically protect themselves against cold (such as adventurers, spellcasters, and other wealthy folk) often do so, and in turn are aware that their enemies might have similar protection. This means that magic-using NPCs are less likely to use cold attacks. since doing so is often a waste of time (though the followers of Auril, unpopular even in the Moonsea, would disagree). PCs who gird themselves against magical cold in anticipation of many "cold mages" in the area might be surprised that fireball and lightning bolt are just as common here as in warmer lands. City-States: Because of the danger of bandits, monsters, and military rivals, civilized populations gather in large settlements and behind walls for protection and comfort; every town has at least a wooden palisade wall. 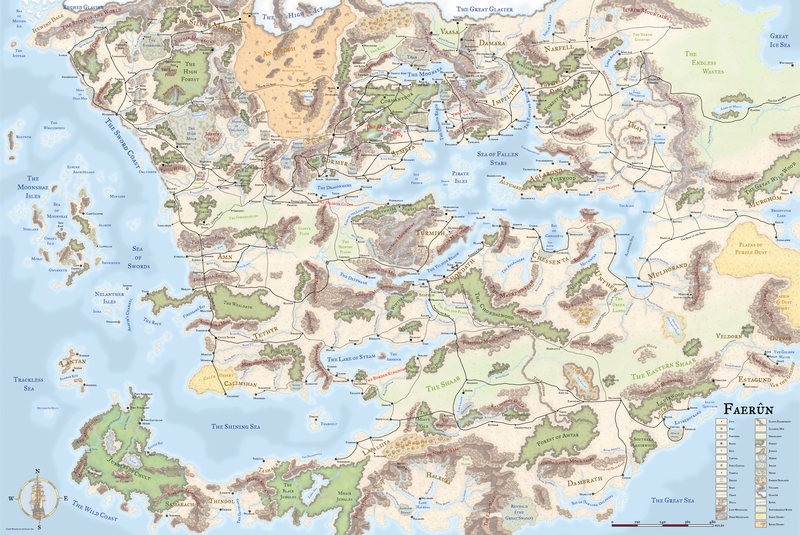 Adventurers traveling cross-country are much less likely to stumble across a hamlet or village here than elsewhere in Faerun. Most settlements don't allow visitors after dark, and some even refuse entry to strangers during the day except under special circumstances -- even visiting merchants must make their deals outside the town wall. Monsters: Though most parts of Faerun have at least occasional problems with marauding monsters, the Moonsea is particularly dangerous in this regard. Surrounded by old mountains and ancient forests, and divided by a mysterious deep sea, the land here has more than its fair share of strange beasts. In particular, the lake was once called the Sea of Dragons because of the many dragons that came here to mate; its forests and mountains are still riddled with dragon lairs. Moonsea folk do not scoff at rumors of monsters -- they tighten their belts, sharpen their swords, and expect the worst. Monster trophies do not impress them; such things hang in the main hall of most towns that have managed to survive for more than a few years. Religion: The common faiths of the Moonsea reflect its dangerous nature; most of the gods worshiped here are of the "worship me or bad things will happen to you" variety, and the rest fall into the "worship me or I will do bad things to you" category. Whether overt or subtle, these faiths influence how the local people think. Visitors who worship bright and noble gods are likely to be scoffed at behind their backs, while those who worship "frivolous" deities such as Eldath, Lliira, Milil, Sharess, and Sune are often derided to their face. Adventurers who proselytize "foreign" religions quickly draw the attention of Banite loyalists and others who openly serve the evil deities favored here. Most Moonsea folk pay lip service to these deities just to keep potential threats away, not necessarily fully embracing the dark philosophies of these deities. Suspicion: Because of their frontier situation and the many threats in the Moonsea (particularly from rival city-states), the people of the region are mistrustful of any stranger, since any unknown person could be a spy or assassin from a rival settlement. Unlike other harsh lands where a culture of hospitality to all became the norm for the sake of survival, the Moonsea folk have more of a "take care of your own" attitude. This also makes them reluctant to turn to outsiders for help except under great duress, or when they have no questions about a person's motivations (for example, even in the Moonsea a paladin of Torm is someone you can trust to help you without an ulterior motive). Strangers must prove their worth before earning even a small measure of free hospitality. While the people of the Moonsea are not inherently evil or distrustful (any more than the people of the Dales are inherently friendly and good), that is the attitude bred into them by a culture where survival is hard work and the kind-hearted are usually taken advantage of. River Duathamper: The River Duathamper is a minor tributary of the Moonsea that flows through the forest of Cormanthor from the south. A few woodcutters cut timber from its banks and float the logs downriver to the Moonsea, but the elves of the forest quickly run the interlopers out. River Stojanow: The swift, cold River Stojanow flows to the Moonsea from the foothills of the Dragonspine Mountains. Ships and barges carry ore from Dragonspine mines to Phlan and Melvaunt. 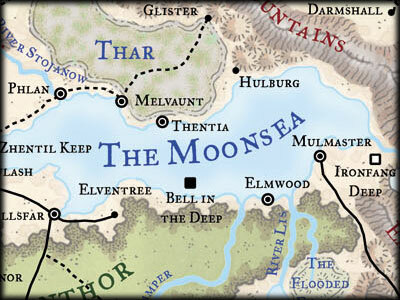 Elmwood (Village, 500): Elmwood is a small farming community on the southern shores of the Moonsea. The locals supplement their incomes with fishing and woodcarving, and they sell their goods to passing ships and adventurers at fair prices. Few places in the Moonsea can be called peaceful and serene, but Elmwood is one of them. Constable Thoyana Jorgadaul (NG female shield dwarf Ftr8), an adventurer who retired here years ago, oversees the community. Elmwood owes its security both to its isolation and the simple fact that no one in the town owns anything worth stealing. The city of Melvaunt sits on the northern coast of the Moonsea, and serves as the port of entry to many travelers coming to the region. The Northern Moonsea region stretches inland from the shore all the way to the edge of The Ride, encompassing all of Thar. The River Stojanow marks the region's western border; the Galena Mountains frame the region to the east. The city of Glister at the northern edge of Thar is nominally a part of the region, but its people and customs differ significantly from those along the coastline. 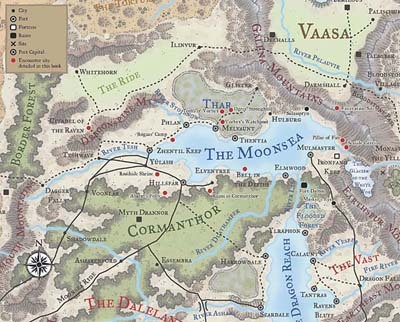 The Northern Moonsea is a harsh place whose independent cities are not well connected by roads; most of the region's famed trade takes place by boat. None of the area's rulers want to spend time and money making it easier for armies to march upon them, so roads remain a low priority. The Phlan Path is perhaps the region's most proper road, but even it resembles nothing more than a rutted dirt trail in places. Ships from Melvaunt constantly shuttle goods to Mulmaster and Hillsfar, where these items can be more efficiently distributed around the region. Legitimate trade with Zhentil Keep is dangerous and rare, but the black market is alive and well, despite the city's attempts to crack down on "traitors" that would do business with their enemies in the west. The geography of the Northern Moonsea area can be described in three words: drab, marshy, and cold. Vast swaths of the region have little to no vegetation, and the landscape is rarely broken up by trees, hills, or rivers. Building roads through the land is expensive, time-consuming, and ultimately futile, because the stones sink farther into the marsh year after year. Structures outside the major cities encounter much the same problem, and few people have found a compelling reason to build fortifications to defend such unwelcoming terrain. With little vegetation, frequent incursions by monsters, and a cold climate, farming is relatively unknown along the Northern Moonsea. In the western section, along the River Stojanow, a fertile belt allows for the sowing of some grains and a few hardy vegetables. Without the protection of a major city, however, no large-scale food production takes place. Few small communities pop up in the north for similar reasons, so most of the region's population is concentrated in its cities. The Great Gray Waste of Thar occupies a large section of the north. It is a bleak and desolate region of marshlands and cold plains, with the occasional mountain or rock formation to break up the landscape. Tribes of orcs and ogres rule, making their homes wherever they can carve out a niche. Scavengers and predators roam the land, from the ubiquitous monstrous vermin to green dragons to the animated skeletons of the unfortunate dead. The western portion of the Moonsea region, which includes the city of Zhentil Keep, stretches from the great body of water from which the territory gets its name all the way to the Border Forest in the west, and from the northern fringes of the mighty Cormanthor Forest to the tribal lands of The Ride in the north. The River Stojanow serves as the region's northeastern border, while Yulash marks its southeastern limit. Most people also consider Voonlar to be part of the region, demarking its extreme southwestern border. Good roads connect many of the communities, with major traffic flowing along the trade triangle of Voonlar, Zhentil Keep, and Teshwave. Another major route leaves Zhentil Keep and passes through Yulash on its way to Hillsfar in the east, while minor roads run to Phlan to the northeast and to the Citadel of the Raven, Zhentil Keep's companion community, to the north. Trade continues south out of the Western Moonsea region and into the Dalelands and points beyond. 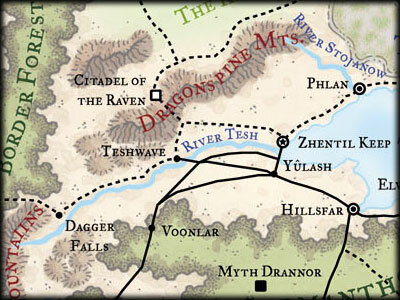 Within the Western Moonsea, two geographic features dominate the landscape -- the River Tesh and the Dragonspine Mountains. The river, which flows from Dagger Falls near the northern tip of the Desertsmouth Mountains, serves as a major trade route, particularly between Teshwave and Zhentil Keep. The Dragonspine Mountains bisect the region from the southwest to the northeast and provide many valuable raw resources as an enticement to the entrepreneurs attempting to carve civilization out of the wild places. Though far from being the largest or tallest mountains in Faerun, the Dragonspines are rugged and often bitterly cold throughout the year, making them a danger to even the hardiest explorers. In between these landmarks, the Western Moonsea region features miles of bleak grasslands and moors no one dares travel across alone. A few farms lie scattered throughout, but most people with any sense stay close to the cities and towns, where protection from marauding monsters is readily available. While the Western Moonsea has the greatest concentration of population of any part of the region, this doesn't mean there are folks packed shoulder to shoulder anywhere. Its vast reaches are filled with ancient ruins, dank tombs, remnants of civilizations old even by elven standards, and scores of bloodthirsty humanoids and even more hazardous beasts.